Foursquare Chandelier shown in bleached oak, turned wood, linen shades and brass fittings. Wood Finish: Bleached oak or specify. Due to materials and process the wood finish will vary throughout and will differ from order to order. Metal Finish: Brass or specify. 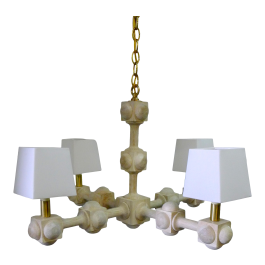 Height: 17"h fixture (with top brass loop is 19"h), drop height overall is 50" overall with chain and canopy. Candelabra 60w max ea, 40w max if shaded.